Refrigerators are basic parts of our everyday lives and they save us money by slowing down the spoil rate of our food. Thanks to refrigerators, leftovers are possible. Thanks to refrigerators, expensive, fresh produce stays edible longer so we don’t have to throw it away and buy more. Thanks to refrigerators, condiments and frozen treats can stick around for months and still be enjoyed without worry. Of course, you can usually reach into the back of a refrigerator and find food that has been forgotten for half a year and is now unrecognizable. We’ve all been there! Refrigerators are foundational to our modern lifestyle, and when they have trouble, it can take a long time to sink in. We don’t want our refrigerators to have problems. When they break down, we’ll still find ourselves planning to buy groceries and realizing we have no place to put them or looking forward to a chilled drink only to remember the fridge needs work. That is why prompt, excellent refrigerator repair service is so important. 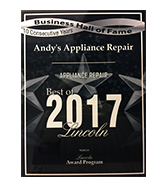 Andy’s Appliance Repair is proud to be Lincoln’s answer to all refrigerator and appliance issues! You’re seeing puddles under the fridge. When you step up to the fridge and get your toes wet, it can be a pretty unnerving experience. Leaking fridges need to be addressed immediately because they can heavily damage the floor beneath them. If your fridge has an ice maker, chances are good that it has a leak. Make sure you find the dedicated water shutoff valve for your fridge, turn the water off, and give us a call immediately. 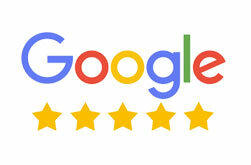 We offer same-day service and can quickly make things right. Your fridge keeps cycling on and off. All fridges make a little noise, and if you can tell that your fridge is turning on and off more frequently than normal, there’s a good chance the condenser coils are struggling to do their job. They are part of the process of creating the cold air your produce depends on, but they get blocked and dirty sometimes. We can carefully clean them up and get your fridge back to normal again! While we all wish we could descend tiled stairs into the sacred, cool dimness of a traditional wine cellar, that isn’t always realistic. Instead, we need different ways to keep wine cool. Electronic wine cellars are the answer! These electronic refrigerators customized for storing wine are perfect for anyone from the casual wine enthusiast to restaurants that need to keep large volumes of wine chilled at all times. The best thing about these modern wine cellars is that they can be customized to look however you want them to look. You can make them the centerpiece of your pantry or restaurant or keep things simple in the kitchen. Because wine cellars are basically specialized refrigerators, they run into a lot of similar issues. Just like you keep an eye on your refrigerator, make sure you keep an eye on your wine cellar as well. Great wine isn’t cheap, and even though your wine cellar can keep your investment safe when it’s functional, it can damage that investment when it has trouble. Here are some things you should watch for, and if you see them, it’s a good idea to give us a call in Lincoln. The unit is dripping water. Functional wine cellars do not produce water. If you’re seeing your unit drip, it means there’s an air leak somewhere. The leak in the cellar’s seal is allowing warm, moist air into the unit, where it condenses into water drops and leaks out. All refrigeration units are designed to seal and prevent the ambient environment from having an impact on them. We can help if your wine cellar is starting to have problems, so contact us! You’re seeing ice build up inside the unit. Freezing wine can ruin it, so if you start to see ice in your cellar, it’s time to figure out what is going on. Ice can show up for several reasons, including a malfunctioning evaporator fan, obstructions to airflow, trouble with wiring, and a bottle probe that needs to be replaced. Both light and temperature are threats to wine, and modern wine cellars do a phenomenal job of protecting wine from both. 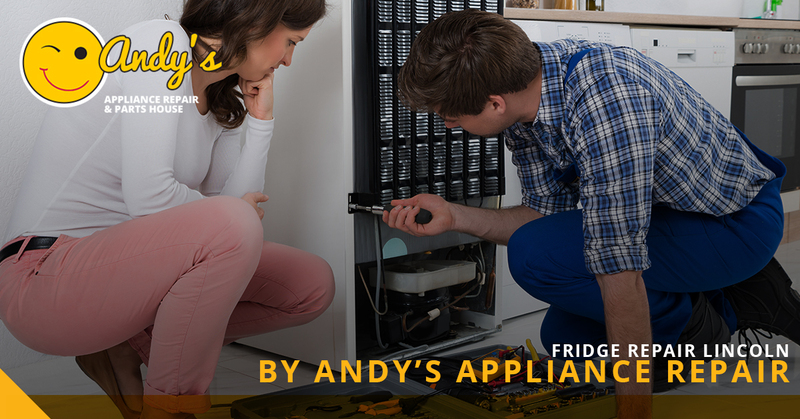 At Andy’s Appliance Repair, we are proud to provide world-class refrigerator repair services in Lincoln and beyond. 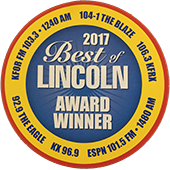 If your wine cellar is acting up, contact us in Lincoln today! Refrigeration has come a long way, and we aren’t restricted to standalone units anymore! Under-counter refrigerators can come in drawers or cabinet styles, allowing you to implement refrigeration in smaller spaces. We love under-counter refrigerators because they make it possible to keep important ingredients closer to workspaces in both residential and commercial kitchens. They also can be the perfect solution for small kitchens, dens, rec rooms, outdoor kitchens, and other locations where you need a cooling unit but not a full-sized refrigerator. One of the favorite implementations we just mentioned is the great outdoors. If you love to grill and entertain outside, it’s important to have a place where you can keep drinks and snacks cool. You can even get a freezer to keep dessert ready when the time comes. Sub-Zero pioneered the under-counter refrigerator, and their stainless steel designs are tough enough to handle any kind of conditions. They can be built into the surrounding cabinetry and designed to look truly beautiful. Another place you can put an under-counter fridge is boardrooms. Do you like to offer water and other beverages to your guests? Just keep them in the room! When you need to cool down, there’s nothing like a cold drink! If you think about it, our ease of access to ice is relatively new in the grand scheme of things. We no longer have ice trucks making deliveries to our homes, but that was the norm less than a century ago! The technology that allows us to get ice whenever we want it is very young. Ice machines have come a long way, but any mechanical system eventually breaks down, and ice machines are no exception. Whether you’re dealing with a commercial ice machine or a smaller one in your home, keeping an eye on it is very important because ice machines are infamous for flooding. The room is too warm. This is an issue more than a malfunction. Many people don’t know that the production of their ice machines depends on water and air temperatures. The higher the water and air temperatures, the lower the ice production. It takes a lot longer to get the volume of ice you need because the machine has to work harder to freeze the water. If the temperature gets above 95 degrees, many ice machines will stop producing ice altogether. If your ice machine isn’t giving you the performance you need, check on the ambient temperature of its location; you might find the root of the problem! The water is too hot. Leading off of the previous point, if the water feeding into your ice machine goes over 90 degrees, it will take far too long to freeze. As a result, the freeze cycle timer will be tripped and the machine will shut down to protect itself. In general, we find this problem occurs when another appliance (such as a dishwasher) pumps hot water into the ice maker’s water line. In that case, we can track down the issue and quickly get your freezer back online. The ice machine is getting low water flow. One of the first things we check when an ice machine is struggling to perform is the flow of water getting into the machine. It can’t make ice if it doesn’t have enough water to do so! The water supply might be low or the filter into the machine might be clogged, resulting in malformed cubes and a frozen evaporator. A frozen evaporator can stop the unit from producing anything at all. Water is leaking into the machine. Sure, you want water going into your machine, but it needs to go to the right place. If it’s just leaking in, there will be problems like oversized ice cubes that get stuck in the evaporator and make it freeze up. Water leakages are usually caused by leaky valves, and you’ll want our team to quickly identify and fix the problem. Much like electronic wine cellars, built-in refrigerators offer revolutionary benefits that are both aesthetic and practical. These refrigerators are only finished on the front because the front is all you see. The rest of the fridge is tucked into a wall or a bunch of cabinetry. Many times, people will design their built-in refrigerators to look like the rest of their cabinets, therefore blending the appliance into the kitchen or rec room for a truly subtle, luxurious effect. Others keep the fridge looking fridge but benefit from the way it seamlessly integrates into everything around it. Discriminating home and business owners who like to know what to do if something goes wrong with their refrigerators can find built-in units a bit unnerving. You cannot just pull a built-in unit out and inspect it. The good news is, built-in refrigerator care and maintenance doesn’t have to be an ordeal. 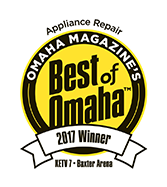 Our professional team has years of experience with these types of appliances, and we aren’t intimidated by them, no matter how old or new they may be. However, we want to empower you to receive your refrigerator’s warning signs, so we’re going to share a few here. These are all signs that your built-in refrigerator needs the specialized expertise of our team. You’re seeing puddles inside the fridge. Things spill inside our fridges once in a while, but if you’re consistently seeing pools of water, you may be observing the symptoms of a blocked drain tube. We can easily free the drain tube up and get your built-in fridge going strong again. Your produce keeps spoiling. If you’re getting frustrated with your grocery store for selling what seems to be low-quality fresh produce because it spoils quickly, you may need to direct that attention toward your refrigerator instead. Is it cooling as well as it should? If it isn’t, there are several possible reasons why. You will want to give our team a call so we can come troubleshoot and resolve the problem.